Custom 3 Season & 4 Season Porches in Minneapolis & St. Paul, Minnesota | Carver Construction Inc. Carver Construction is the premiere resource for the porch of your dreams! 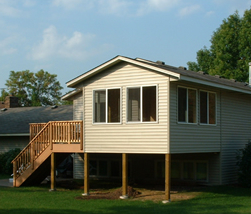 We use the highest quality porch products and we provide custom designs and professional installation. Our excellent service makes your investment in a new porch an enjoyable experience. All of our outdoor projects are built to code and guaranteed to last! There are many options to choose from for your porch and of course, you want an outdoor living space that reflects your individual taste and style. Your porch also needs to be big enough to accommodate your porch furniture and accessories. That’s where Carver Construction comes in. We take your lifestyle and tastes into consideration when planning your porch design. Are you trying to maximize the use of your deck through the seasons? Then a screened porch would be a good option to explore. This type of porch provides protection from the sun and mosquitoes, allowing you to enjoy deck time both in the daytime and at night. Our screen systems are heavy-duty and maintenance free, perfect for Minnesota living! Maybe you’d like to enjoy your porch during the harsh winter months? Carver Construction can provide a four-season porch that fits any lifestyle. Whether you want a sunroom, a second dining room, or any other creative or casual use, our four season porches bring style and added value to your home.